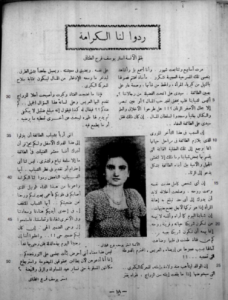 Al-Tanani wrote two articles in the Egyptian Karaite Jewish periodical Al-Kalim taking the Karaite community (particularly some of its younger men) to task for marginalizing women. In order to explain the article and what she was trying to accomplish, I need to share with you a brief bit of history and a story. According to family sources, the middle of the 20th century was a time of great change and uncertainty in Egypt, especially for the Jews. I had heard for years from my family that the men would get university-educated, get married and leave. The woman would generally not receive a formal education beyond high school (or the equivalent), but would get trained in home economics. Because of the uncertain future for Jews in Egypt and because parents had paid for their sons’ educations, men lacked the money to pay the bride’s family a dowry – which was customary in biblical times and even till this day in many parts of the world. And because parents did not spend money educating their daughters, they had “extra” money sitting around. So the community in Egypt flipped the biblical model (in which the man pays a dowry) into a practical model in which the woman’s family pays the man’s family a dowry. In any event, as the situation became more precarious into the middle of the 20th century, the price that young men (and in many cases, their families) demanded in return for marriage skyrocketed. The problem was so bad that the local congregants at the Karaite Jews of America have strong and sad memories of many potential marriages falling apart due to the families’ inability to agree on the value of the dowry to be paid by the woman’s family. “Many cases,” they reiterate. It was a bitter time for them. To illustrate how real the problem was – and the extent to which it affected and infected the social order in Egypt – I want to share the story of a Karaite Jewish woman named Sarina. In the early 1940s, Sarina and a female friend went to visit a young dental professional named Moussa (Hebrew: Moshe). The purpose of the visit was simple: Sarina was to ask Moussa whether he was interested in marrying Sarina’s friend. Undeterred, Moussa married Sarina. He was so impacted by the response and the situation that he set up a charitable fund for young women who did not have the money to pay a reverse-dowry. Moussa and Sarina Pessah are my maternal grandparents. And don’t worry, the other woman in the story also got married. I cannot ignore that in today’s Jewish world, there is a tendency to view female religious activists as deviators from tradition and ignorant of religious law, regardless of how ill-founded was the tradition or the interpretation that they are trying to change. I can say that while in Egypt, al-Tanani (according to many who shared stories of her) was an extremely pious woman. She even regularly attended selihot prayers (which are held at midnight between Yom Teruah and Yom Kippur). She was extremely well educated in Judaism and the Karaite tradition in particular. Solely so that you understand that she grew up in a household that valued religion and tradition, I note that her father was the famed Effendi (“Teacher”) Yusuf who taught many Karaites how to pray properly. I owe a debt of gratitude to Katharine Halls, a researcher of Karaitica, who first alerted me to the story of al-Tanani and her articles. I was so moved by Katharine’s research and by the stories and frustrations of the young women in the community that I spoke about it for five minutes in this video (which is queued to the proper spot). I am pleased to announce that Katharine will do a guest post this week adding more details on the context of the marriage crisis and of al-Tanani’s articles, with a translation of the article Give us Back our Dignity. Esther Yusuf Farag Rasson (nee al-Tanani) left behind a daughter when she passed away last week. As we say at the end of our memorial prayer: Umenuhata beGan Eden (And may her resting place be in the garden of Eden). I find it beautiful when women fight for their rights and at the same time remain very observant! But it’s strange to note that in Europe, not too much time ago, this reverse dowry was actually the standard dowry. You can see in old books like Ivanhoe, The Three Musketeers , Don Quixote and others that this was the commom practice at that time. I wonder where this practice came from. In the Islamic religion, it was the man who came up with the dowry to win the approval of the bride’s parents for marriage. Spain being invaded by Salah El Din most probably had an impact on this strange custom. I am curious to know how the Egyptian Karaites justified- in Torah- the reverse dowry? They didn’t. That is why they came up with the legal maneuver that the man (upon divorce) pays twice the what the wife brought into the marriage.